Sportswear, headphones and high street fashion brands have seen their ads nominated for a Campaign Big Award this year. There are four entries shortlisted for the Fashion, Clothing, Footwear and Accessories category, which was chosen by judges on Friday, 21 August. 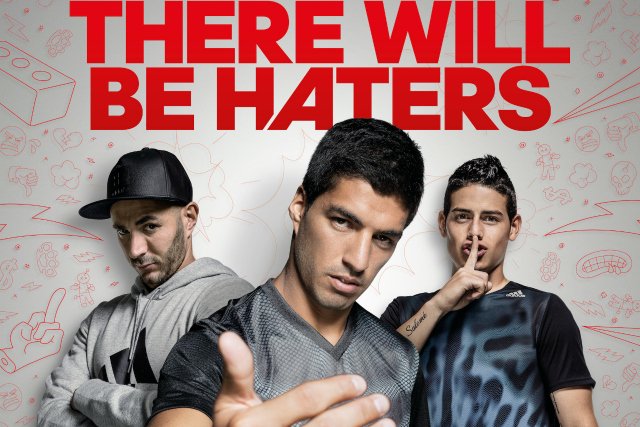 Adidas’s "#therewillbehaters", created by Iris Worldwide, was chosen as a campaign and a single film. The brash ad for a range of football boots included the slogan "They hate your shiny new boots. Because they wish they were in them." Adam & Eve/DDB also made the shortlist for its summer 2014 "bad fit" campaign for Harvey Nichols. The work chosen included a press campaign, outdoor campaign, press single and outdoor single. The "every milestone" film for M&S by Rainey Kelly Campbell Roalfe/Y&R also made the shortlist. The ad was part of its back to school campaign on the retailer’s social media channels. And R/GA London’s "game before the game" ad for headphones brand Beats By Dr Dre, which won five lions at Cannes (one gold, three silver and one bronze), also made the list. The ad depicts French and German celebrities ahead of the a World Cup match between the nations at the 2014 football World Cup. The judging for the Campaign Big Awards took place London last week for five days. The shortlists decided by the judges were revealed the next day on Twitter and on Campaignlive.co.uk.